New Sustainability Initiatives in Dining for Purdue's 150th Celebration! Paper Straws - In an effort to be more eco-friendly, Purdue Dining heightens it’s efforts by removing plastic straws from its food operations. The transition from plastic to paper straws will be fully implemented by March 18th in celebration of Purdue’s sesquicentennial celebration. This will include all retail outlets, along with On-The-GO! locations in the dining courts and Marriott Hall. Dining & Culinary officials estimate 650,000 plastic straws were used in campus dining and retail locations last year. According to the National Parks Service, Americans use an average of 500 million straws every day, which amounts to approximately 182 billion straws per year. Read the full press release here. In addition to implementing paper straws, new ECOLOGO® and Green Seal™ certified white napkins were ordered for Dining's 150th celebration and are made from 100% recycled fiber, 90% of which are post-consumer fibers and are compostable. See our other Dining initiatives and events for Purdue's Sesqucentennial during March by visiting our 150th page here. Share information about new sustainability opportunities, metrics and research with both internal and external customers. 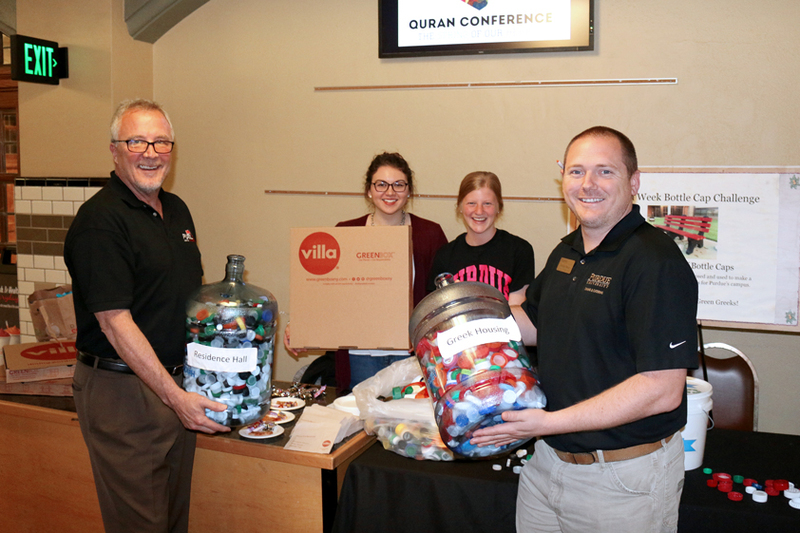 Starting with a committee effort in 1993 and continually growing, the decisions and actions in Purdue Dining & Culinary have helped keep food costs down, divert waste from the landfill and promote academic and vendor partnerships. Purdue University defines local as food purchased from Indiana and the four bordering states. For tracking purposes, we code for purchases within 250 and 500 miles for both products grown and processed. Harvest Week during Green Week – Annual lunch during Green Week that reaches over 8,000 students. 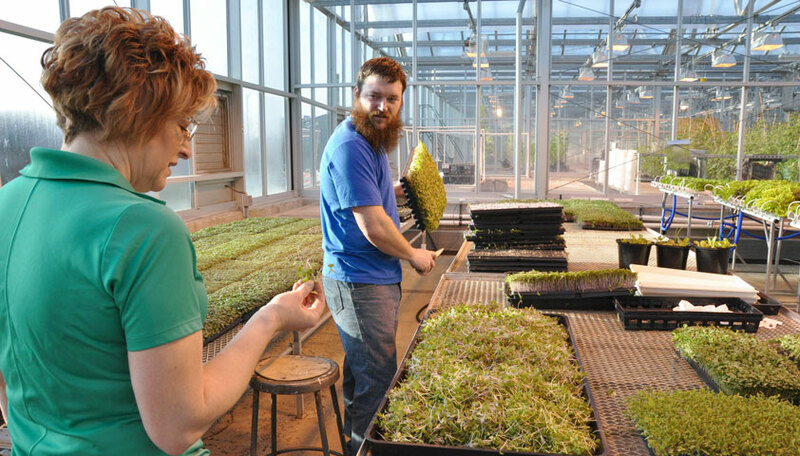 Earth Day – Annually host a seed planting in the dining courts each spring with a Student Farm representative displaying a bed of microgreens and educating the students as they plant a small container to grow in their room. Purchasing “GreenBox”, an eco-friendly pizza box made with recycled material with 27,250 boxes used in a year. Purchase locally-sourced food and beverages, arrange for leftover food to be donated to a local food bank whenever possible, use Earth Wise Tree Free napkins and recycled-paper cups from the Bare line by Solo. The Purdue Memorial Union is dedicated to water-saving devices, energy efficiency measures and environmentally-friendly cleaning agents, all in an effort to minimize negative impacts on the environment. Sea to Table – The Gathering Place and Sagamore Restaurant feature Sea to Table products. This partnership connects local fishermen from small-scale sustainable wild fisheries to markets for their catch. They deliver overnight direct from the dock, creating a direct connection from fisherman to chef. 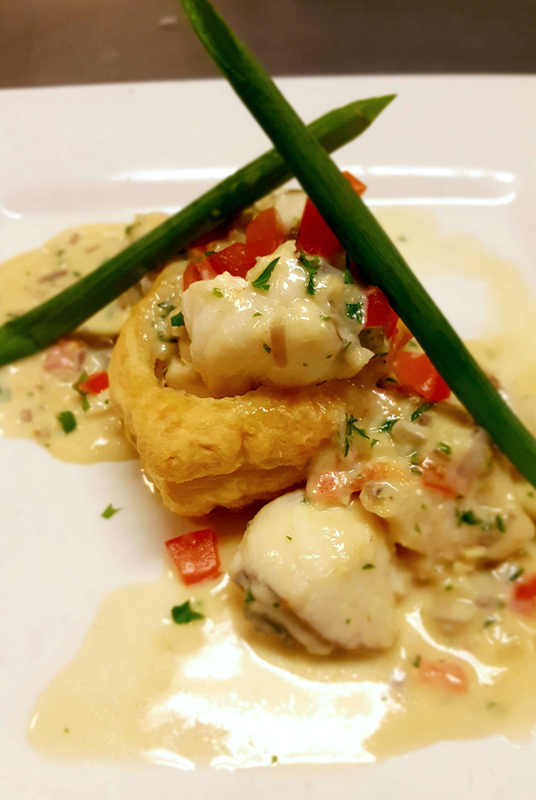 Sea to Table Monkfish “Scampi Style” was featured at Sagamore Restaurant in observance of Food Day and Green Week. 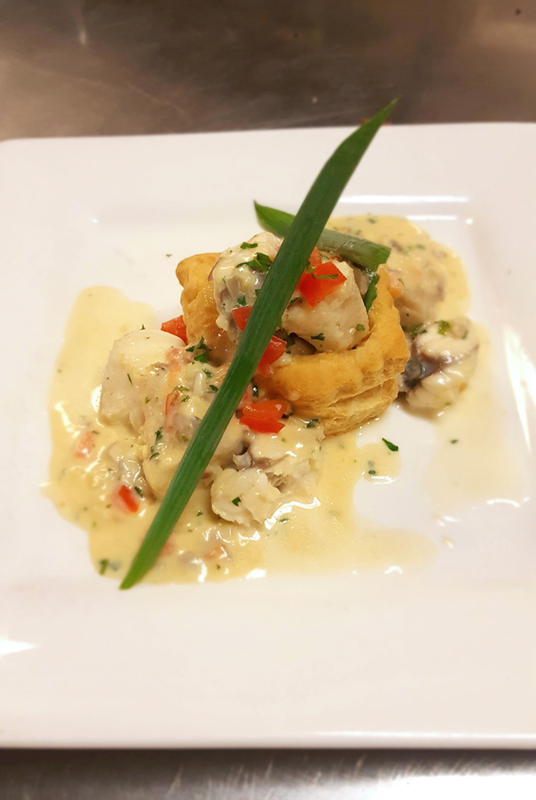 Monkfish offers an excellent way for colleges and universities to meet their sustainability goals while offering a delicious protein to their customers. The fish is versatile, healthy, abundant and sustainably caught. The partnership with the Purdue Research Farm continues to grow, with apple harvesting increasing by 43%. 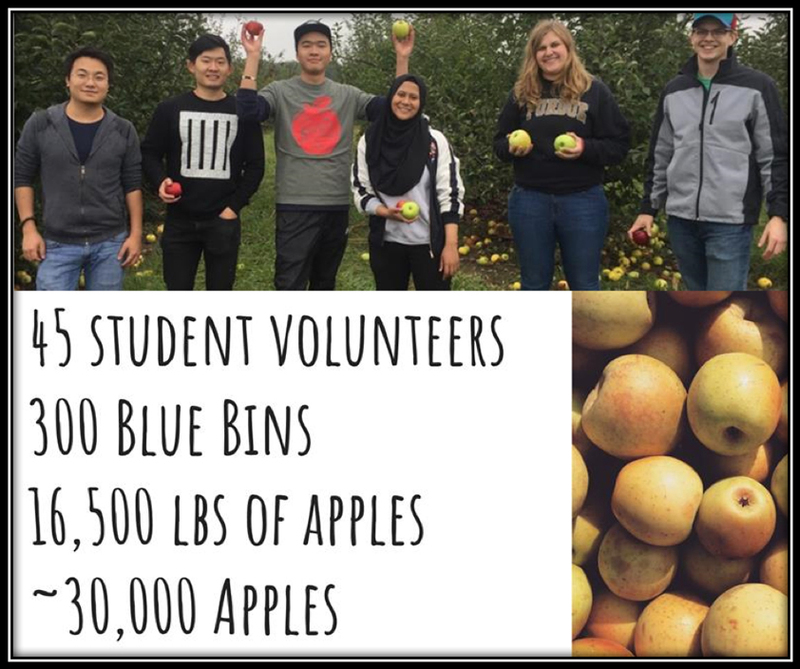 Over 30,000 apples were picked by staff and 45 volunteers. Corn, cantaloupe, watermelon, and Roma tomatoes were also harvested. Ford and Windsor Dining Courts, along with Catering and the Sagamore Restaurant, are regular customers purchasing 24 different items as they grow products to help meet our needs. Piazza Produce – Automatically replace non-local with local product when pricing is comparable. 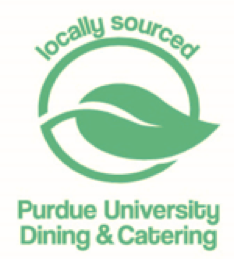 Indiana Grown – Purdue Dining & Culinary is a member and participates in their initiatives. Purdue Butcher Block – Collaboration with the Food Science Butcher Block resulted in 7,400 pounds of sausages featured in Wiley Dining Court throughout the year. Soybean Farmers – Pilot project in partnership with the School of Agriculture and the United Soybean Board with local high-oleic soybean oil in 2016. Sagamore Restaurant continues this partnership. Red Gold – Purchasing locally grown and processed products from this vendor located in Elwood, IN. Dannon – Recently established a plant in Warren County, IN and is a partner in Purdue Dining initiatives. Reusable Cup Program – All residential students are presented with a cup to use in retail and On-the-Go! locations throughout the year to cut back on paper cup usage. Zero Waste Events – Spring Fling 2013 which was the first zero waste event diverting 1,170 pounds of waste from the landfill. This continues as an annual initiative. Pulpers – Long before the dining courts, Purdue introduced pulpers to compress food and napkins at the dish return. Where this “Yak” once went to be composted, it is now sent to the anaerobic digester at the West Lafayette Wastewater Treatment Plant where it is turned into methane to help power the plant with the by-product going to local farmers. Napkins – 66% or 6,852,000 napkins used on campus are a 13 x 12” brown dispenser napkin that is 100% recycled, 1 ply, certified EcoLogo, green sealed certified. Pallet Recycling – Used pallets are either exchanged with the vendor or recycled. Damaged pallets are sent to a company to be turned into mulch. Tray free Dining – All dining courts removed trays Fall 2013 and realized an 18% reduction in post-consumer food waste as students started taking smaller portions. Energy Saving Commitment – The Purdue University policy is to purchase Energy Star equipment for all products that are eligible for the EnergyStar rating. All new snack machines use LED lights, saving 50 percent of the energy used by a standard snack machine. Vending has an energy saving initiative which started in 2010 implementing a lights out campaign on Coca-Cola beverage machines when no one is using them. To save water, pre-rinse spray valves were installed on all commercial kitchen sinks. By reducing water use, these devices also reduce water heating energy and sewage treatment costs. Cardboard balers – Three dining courts installed balers to handle the volume of boxes. Ford Dining Court can produce 3-4 bales a day as they serve 6,000 – 8,000 meals per day. Biodiesel production from fryer oil and grease products – Purdue diverts over 8 tons of fryer oil and realizes revenue from the used oil. Deliveries on Campus – Campus food and supply delivery routes are evaluated and adjusted annually to maximize productivity. A contract with Coca-Cola requires that deliveries be made with a hybrid truck. Green Cleaning Program – Produces the sanitary conditions required in food service while reducing chemical use to protect the health and safety of custodial and food service workers, Purdue’s dining guests and the environment. Farmers Market – Summer 2017 Purdue Dining & Culinary used Student Farm produce to make products to sell. Along with this chefs presented products and samplings. Shrink Wrap Recycling – Pilot project with the University started July 2017. In 6 months, 1 bale (1320 pounds) was collected. Bottle Cap Recycling – Partnership with the Green Greeks organization to collect enough bottle caps to have a bench made for Purdue Dining & Culinary. Pete’s Za Pizza Boxes – Entry in 2017 Recyclemania Tournament was the National Winner in the Waste Minimization Category. Food Donations – At closedown periods, food is donated to the local food bank. Apples from the Purdue Farm are dropped at the ACE Student Pantry on harvesting day. 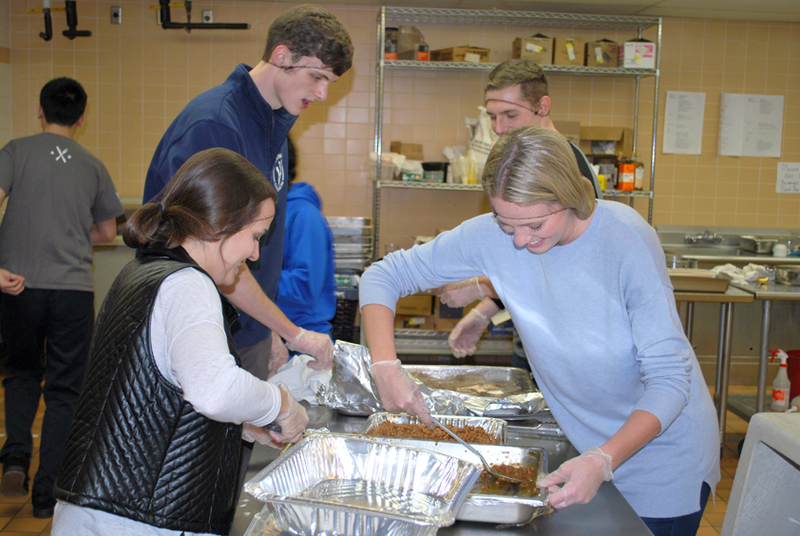 The university’s chapter of Timmy Global Health, along with Purdue Dining & Culinary, have teamed with Lafayette Transitional Housing Center (LTHC) to help provide food for homeless families. Leftover food from The Gathering Place, located on the ground floor of Meredith Hall, will be packaged and transported to LTHC by Timmy volunteers twice a week. Swipe Out Starvation – Students can choose a “Swipe Out” card as one of their 4 items in On-the-Go! for a donation split between the local Back Pack Program and an international focus. Nutrition – 2018 National Nutrition Month initiative is “Go Further with Food!” focusing on preventing food waste and loss. 1 gold for Waste Management 2013. Won Case Study Competition for Waste Minimization in 2017.